I do not know how to begin to voice my frustration. And, being a positive person it hurts that my review on WOW-Air, that some of you were looking for is a negative one… Especially, because I was very excited to go, riding a relatively new airline for the US to Iceland that has been marketed toward the younger demographic for affordability and adventurous excursions. I believe in constructive feedback, which includes the positive. So, the positive being that WOW Air is comparable to Spirit Airlines: the base flight is inexpensive, which is perfect for travelers who are trying to get from point A to point B with as little amenities as possible, everything else is a charge on (carry-on the size of a suitcase, drinks, food,etc). I will say for carry on check-ins, coming from Newark (EWR), the company was pretty lax. I brought a hiking backpack, that did not fit in the small slot that was designated as “free,” but they let it go. The flight there, the flight attendants were kind, alert and helpful. With that said, I had booked a flight there, and a return, with WOW Air and the flight with them to Reykjavik is where the relationship ended, which is a shame. The stay in Reykjavik, the Golden Circle and the South Coast was beautiful and perfect, which will be detailed in later blogs. On Thursday evening on the South Coast excursion, Matt and I were notified that there was a severe storm coming to Iceland, which had already cancelled all outdoor excursions the country offered (which must be HUGE because there are THOUSANDS of visitors each day using various excursions). 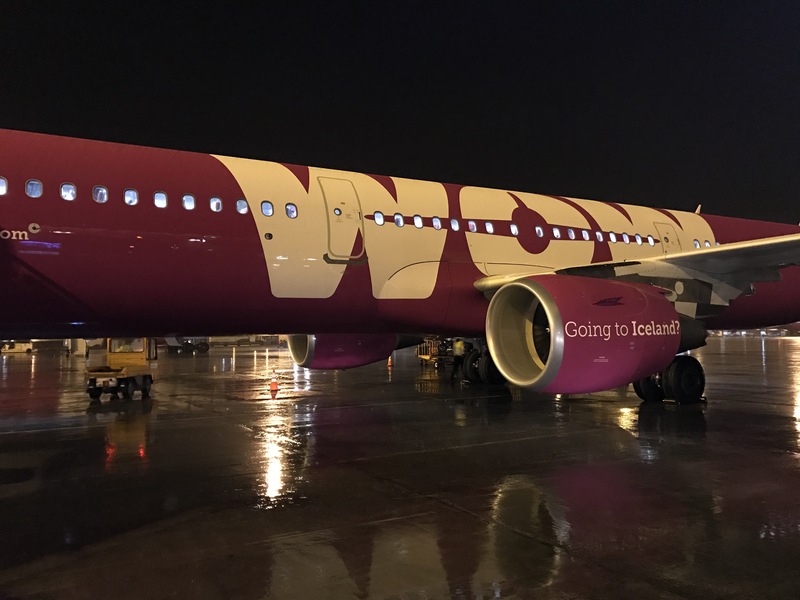 We received a text later that evening to monitor our WOW Air flights as flights from Keflavik Airport to the US may be impacted for weather conditions. On the way out our excursion the next morning to the Blue Lagoon, which evidently was the only excursion not cancelled, we still had not received any update from Wow Air under the impression that flights were still on being that at this point it was already 9:30am, for a 3pm flight. At the Blue Lagoon, rumors circled that the roads would be closing from 12pm-5pm due to weather conditions, so at 10:30a, Matt and I decided it would be best to leave asap via taxi (our complimentary bus ride to the airport was the first bus to leave and was not scheduled until noon). While getting ready to leave, we received a text alert that the flight was cancelled and to call the 1-800 number, which was not a complete number, therefore, did not work. As a result, we decided it would still be best to be at the airport to figure out our updates and alternative options. When we arrived at the airport, the screens noted that our flight was cancelled, therefore checking in to the kiosks was not available. The WOW Air service desk was not opening until noon, so we were one of the first in line. When we were finally serviced, and let them know our flight was cancelled, the WOW service representative asked why we came to airport if our flight was cancelled we noted: we did not have overnight stay available, did not receive a follow up on when the flight would be rescheduled, the service roads were scheduled for closings and wanted to seek other options. The service representative noted that they, at the airport, do not have the answers to our questions and the only forms of communication were to call the service number, contact through social media and to send an e-mail. We asked if we could be put on another US flight that was scheduled to depart, from Boston or to leave of the Newark flight scheduled for the next day, but he said both flights were full and that would not be an option. Additionally, he could not book changes of flight, and that too would have to go through the service number. I asked him to call the service desk, because I refused to leave the desk to have to wait with what had added to 200+ people behind us. He called over a manager who said to continue to call, but that is the same number they use and that due to high volume was likely going to take a while. Of course, costs were incurred for the outgoing calls (for Sprint it is $1.20/minute for calls, and MANY calls were made to unfortunately reach a dial tone). I followed up with the calls on tweets to WOW Air, and two e-mails. The first e-mail asking for an updated status and the second to notify that we would be using a different airline and to receive a refund. It is worth adding that Matt and I used Iceland Air from Keflavik to Chicago for the same day flight at 5pm their time and made it back to the US 6pm central time. Upon landing to the Chicago Airport… no e-mail noting any update, no Facebook update on the flights, no Twitter notifications, NOTHING. Now being in the US tried calling the service line, after waiting 20 minutes, a busy tone and a hang up. It was not until waking up at 5:30am US time on February 25th (so if still stuck at KEF would have been 11:30am), that I received an email saying sorry for the inconvenience they would refund my flight back, and it would take 4-5 business days. My frustration is not that due to weather conditions they believed it would be safest to cancel the flight, it is with the lack of customer service. To not, in timely fashion, provide notification to those with cancelled flights information on how/when the expected time would be to get home. Leaving some, who could not afford a flight back through Iceland Air stranded. Additionally, the hotels in Reykjavik being fully booked, due to the lack of available space for all the tourism that has happened over the last three years (as described by one of our bus drivers on the trip). How does a company who prides themselves, as obvious through their website, in providing the best customer service to Iceland only have ways of contacting a service representative who has answers be through a phone line that did not work, e-mail with no response and social media. Additionally, how are those working at the airport not informed to have solutions, or information in general. To someone who has traveled many airlines this has been the worst form of customer service I have ever experienced. As evidenced by the Facebook & Twitter posts, my frustration is multiplied to many. Come to find out, via Facebook post, our flight was rescheduled to February 27th. Unacceptable. What a shame, WOW Air has a LOT of work to do on the customer service side before I would ever consider flying with them again.